Citations record the part of a source used to provide the information associated with a person. Citation can be added to facts, names, people and spouse relationships. The Citations view shows all the citations in the file grouped either by person, source, repository or citation. Selecting an item displays all the linked citations. Selecting an individual ciation will display all the data items linked with that citation along with the rating of the quality of the information. Fig 1. The Citations view. 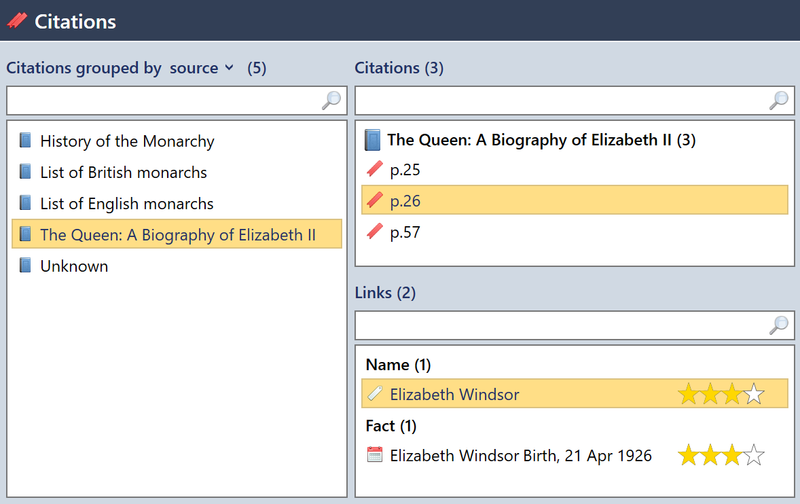 Citations can be added in the citations view or using the citation editor for an item. Fig 2. 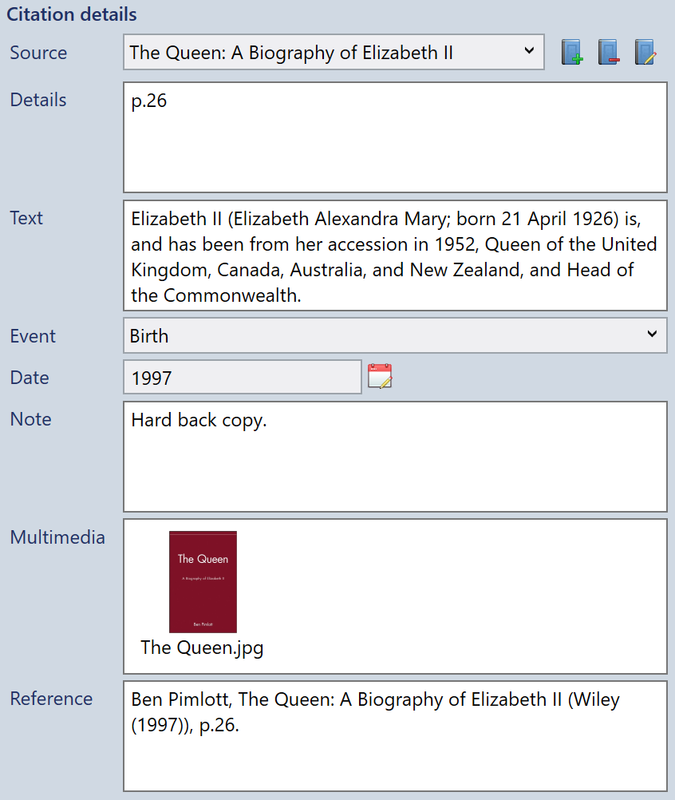 Creating a citation using the citation editor for an item. 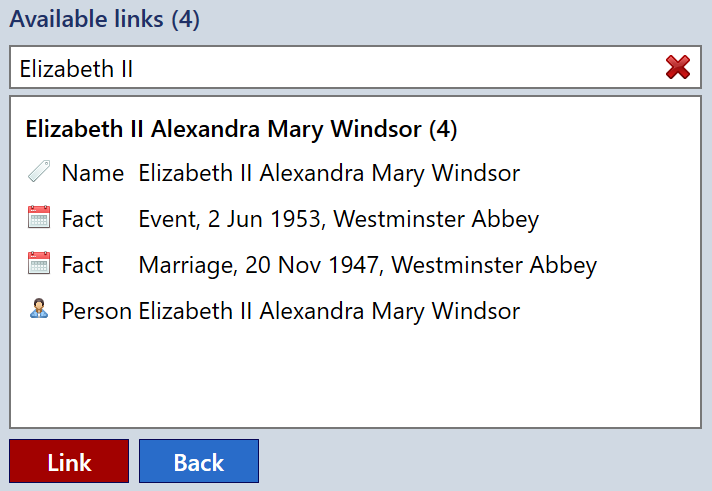 Existing citations can be linked to other items in the citations view. Right click the Links box and choose "Link". Fig 3. Linking an existing citation. You can search for the correct item a list of all items grouped by person. Fig 4. Linking citations with data items. Citations can be edited using the citation editor where the citation was originally created. Alternatively, the Citations view enables you to simultaneously update all instances of a repeated citation. Fig 5. Editing citation details.